High-Quality Neoprene (Wetsuit Material) with collapsible bottom. 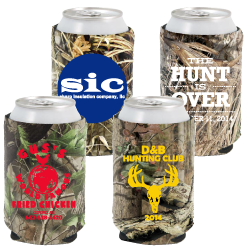 Available in these popular licensed camo patterns: (Click on "Image Gallery" above to see examples of patterns.) Realtree® Hardwoods Green HD®, Advantage® Max-4 HD®, Mossy Oak® Break-Up Infinity™, Mossy Oak® Duck Blind™. Our Neoprene Camo Coolie with licensed Trademark Camo patterns is perfect for the outdoorsmen or “women”. We carry the much sought after Realtree® Hardwoods Green HD®, Advantage® Max-4 HD®, Mossy Oak® Break-Up Infinity™, & Mossy Oak® Duck Blind™ patterns. With a 3.0”W x 3.0”H imprint area you have plenty of space to print your very own personalized design. Printing can be done on 1, both sides, or both sides & the bottom for the same listed price. Our neoprene items offer a large imprint area so that you can fit your design how you intended it to look.